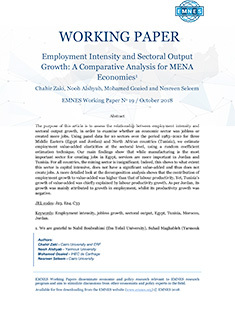 The purpose of this article is to assess the relationship between employment intensity and sectoral output growth, in order to examine whether an economic sector was jobless or created more jobs. 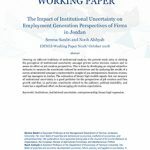 Using panel data for 10 sectors over the period 1983–2010 for three Middle Eastern (Egypt and Jordan) and North African countries (Tunisia), we estimate employment value-added elasticities at the sectoral level, using a random coefficient estimation technique. Our main findings show that while manufacturing is the most important sector for creating jobs in Egypt, services are more important in Jordan and Tunisia. For all countries, the mining sector is insignificant. Indeed, this shows to what extent this sector is capital intensive, does not have a significant value-added and thus does not create jobs. 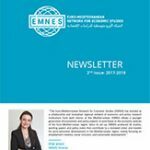 A more detailed look at the decomposition analysis shows that the contribution of employment growth to value-added was higher than that of labour productivity. Yet, Tunisia’s growth of value-added was chiefly explained by labour productivity growth. As per Jordan, its growth was mainly attributed to growth in employment, whilst its productivity growth was negative.